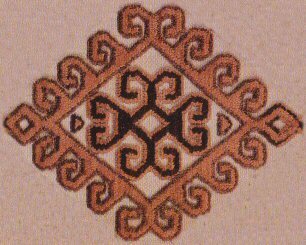 Idealistic illustration of a Karakalpak yurt. 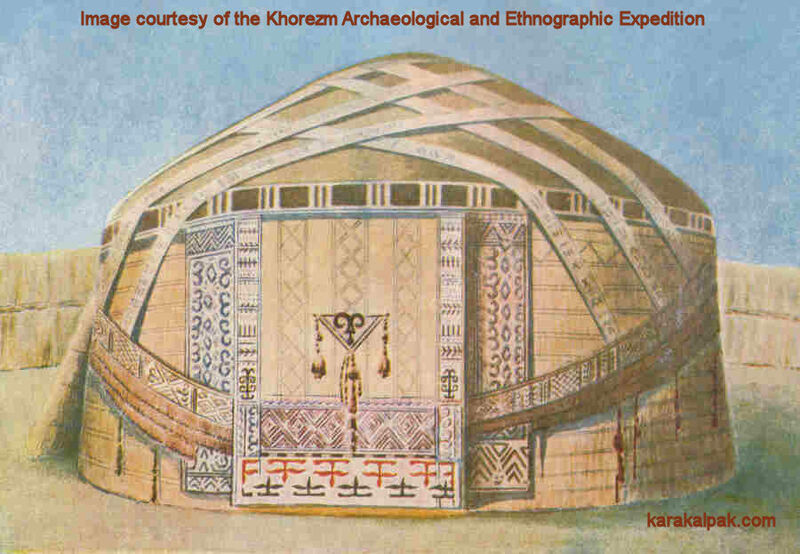 Image courtesy of the Khorezm Archaeological-Ethnographical Expedition. In the past the process of erecting the yurt was accompanied by a whole series of customs, rites, and superstitions. Today these rituals are almost forgotten. However interviews with elderly Karakalpaks over past decades has permitted ethnographers to retrieve some elements of these ancient rites, some of which date back to pre-Islamic times. For example, during the installation of a new yurt or otaw Karakalpaks organized a festival with entertainment and killed a sacrificial bull or cow at the threshold of the yurt. After assembling the yurt framework, shawls containing money from the women were suspended from the shan'araq. Childless women living in the neighbourhood believed it would improve their fertility by offering a dasturqan, a tablecloth with bread and small pieces of cloth, to the master of the yurt. The yurt owners smeared the uwıqs with butter, and hung pepper, onion, salt, and adıraspan on the kerege. They believed that through these rituals everyone in the yurt would live well and remain protected from the evil eye. Many rites and beliefs were connected with the threshold. For example if the life of a person was not to be shortened they should not tread on, or even worse sit down on, the threshold. Beating ones hands on the threshold would cause great harm. However if a man stumbled on entering a yurt this was considered to be a good omen. When a bride entered the house of her husband for the first time she had to touch the threshold with her forehead, then stand and bow to the threshold before stepping over it right foot first. Another old tradition involved burying the placenta of a child under the threshold. This page was last updated on 6 March 2012.